LIV at Fontainebleau, consistently ranked one of the top nightlife venues in the world, will undergo a $10 million renovation July 2017, in time for its tenth season. Melding the allure of the historical Fontainebleau and the future of entertainment, LIV has redefined nightlife on Miami Beach and pioneered the nightlife experience.David Grutman, partner at MMG, has retained acclaimed experiential design firm ICRAVE to oversee the project. 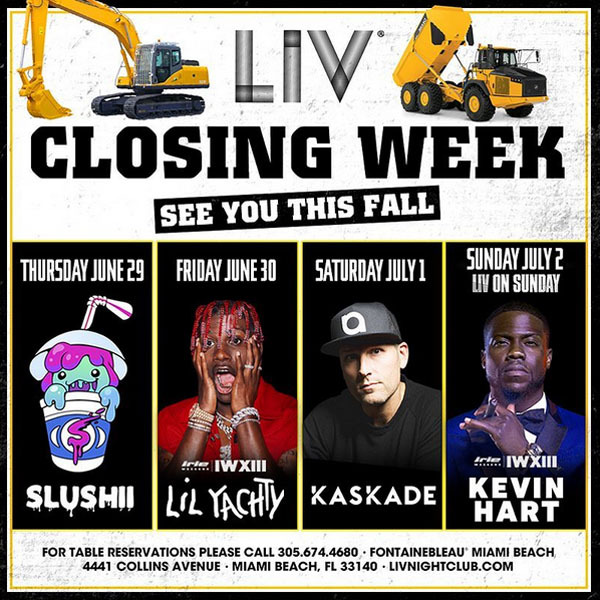 With over 18,000 square feet of striking architecture, soaring ceilings, vibrant lighting and its iconic dome, LIV continues to set the stage for the ultimate nightlife experience. LIV will be updated to reflect the latest in technology and design in the nightlife industry. To refresh the space, ICRAVE focused the redesign on major upgrades to the technology throughout the space. ICRAVE partnered with SJ Lighting to maximize the historic ‘bones’ of the space and transform the iconic dome and steel truss – affectionately referred to as ‘The Spider’. The technological advances will transform LIV into an even more immersive and energetic nightclub environment. The revamped ‘spider’ and its column support legs will be clad with a state of the art robotically controlled lighting ‘chandelier’, allowing the space to expand and contract using over 400 moving LED screens raising and lowering to choreographed movements dance inside the iconic dome. This, along with a general refresh of the look and materials, and the introduction of projection mapping in the space, will keep LIV as the go-to club in Miami and beyond. “We are excited to be part of such an iconic nightlife location that will continue to make an impact on Miami. SJ Lighting’s new chandelier piece is going to create a whole new layer to for the experience in this space which will blow some minds.” Says Lionel OHayon, ICRAVE. LIV’s footprint stands in the home of the world-renowned Tropigala Lounge, known in the 50’s and 60’s as the La Ronde Room. Frank Sinatra was the first to illuminate the stage, followed by the likes of Sammy Davis Jr., Ann Miller, Elvis Presley and Tony Bennet. LIV has once again made the space an epicenter for style, fame and glamour. “Since first opening its doors in 1954, Fontainebleau Miami Beach has been a pioneer in music and entertainment. It is in our DNA and this renovation will continue to position the resort as the premiere nightlife destination in South Florida,” said Philip Goldfarb, President and COO of Fontainebleau Miami Beach. In order to facilitate the work, LIV will close for the summer during the Fourth of July holiday weekend and reopen September 2017. Please stay tuned for closing and opening schedules. Melding the allure of the historical Fontainebleau and contemporary entertainment, LIV has redefined nightlife on Miami Beach. The quintessential nightspot, fashioned by David Grutman and Miami Marketing Group, fuses the appeal of an ultra exclusive lounge and a high-energy nightclub. With over 18,000 square feet of striking architectural design and lavish decor, LIV sets the stage for the ultimate nightlife experience. A voyeuristic design throughout the nightclub gives guests a bird’s eye view of the celebrities, VIPs and Miami’s most beautiful crowd. A spectacular blend of Golden Era glamour and modern luxury, Fontainebleau Miami Beach merges striking design, contemporary art, music, fashion and history into a vibrant guest experience. A revered landmark and symbol of style and sophistication since its opening in 1954, Fontainebleau Miami Beach boasts 1,504 guestrooms and suites appointed with lavish amenities; the world-renowned LIV™ Nightclub, 12 restaurants and lounges including two restaurants from Chef Michael Mina – StripSteak and Pizza & Burger; two AAA Four Diamond signature restaurants, Scarpetta by Scott Conant and Hakkasan; the 40,000-square-foot Lapis spa with mineral-rich water therapies and invigorating treatments; a dramatic oceanfront pool-scape offering lush cabanas; and is home to BleauLive, the innovative concert series that combines intimate performances with memorable weekend escapes. For general information or accommodations at Fontainebleau Miami Beach, visit www.fontainebleau.com or call 1.877.512.8002. Known for creative, high-energy environments that actively engage visitors, ICRAVE has mastered the art of experience design, melding operational, digital, and physical elements across a spectrum of diverse spaces. Helmed by Lionel Ohayon since 2002, ICRAVE has designed award-winning hospitality, airport, development, and healthcare projects, partnering with high profile brands such as W Hotels, MGM, Disney Dream, Hilton, Memorial Sloan Kettering, Summit Series, and OTG. Spanning a number of industries, ICRAVE’s notable projects include Le District, LaGuardia’s Delta Terminal C & D, The Summit at Powder Mountain, STK Restaurants, Provocateur, and more. With expertise in design, strategy, and lighting, ICRAVE is credited with reinventing the modern day airport experience, reimagining cancer care, and transforming New York’s Meatpacking District through creating some of the most iconic nightlife of the last decade.